What’s informally called “UN Week” in New York City continued at UN Headquarters and we used our social media platforms to report on the events. Below are some highlights from Thursday’s activities. 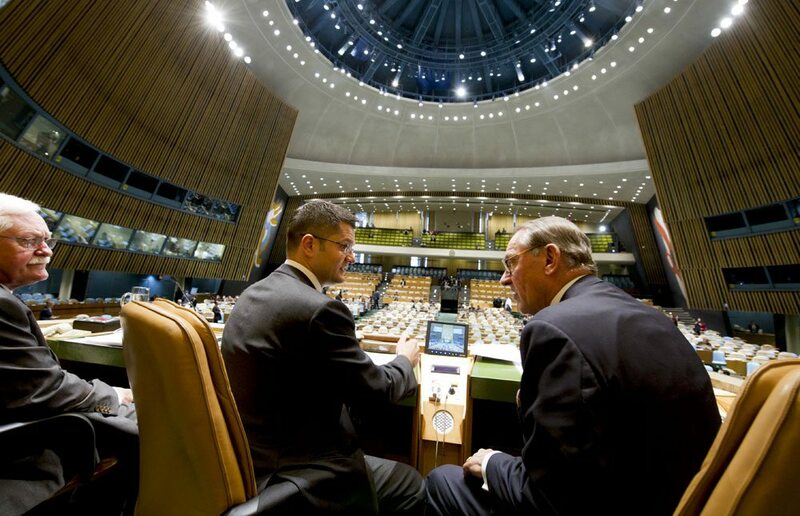 One of our United Nations Photo colleagues caught this quiet moment on camera of General Assembly President Vuk Jeremić and Deputy Secretary-General Jan Eliasson having a chat before delegations took their seats in the General Assembly Hall to resume the debate on Thursday. More behind-the-scenes photos. 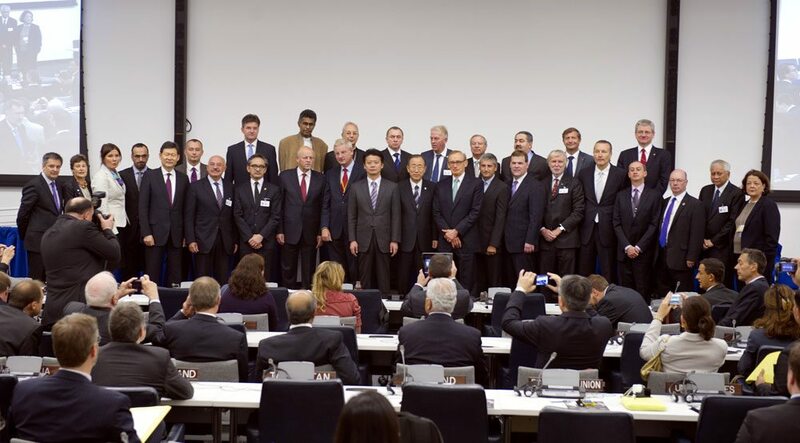 Foreign ministers and other high-level representatives issued a joint call for the entry into force of the Comprehensive Nuclear-Test-Ban Treaty (CTBT), calling it “a vital step towards the reduction and eventual elimination of nuclear weapons by constraining the development and qualitative improvement of nuclear weapons. Heads of state from Afghanistan, Nigeria and Pakistan stood alongside donor government officials and new donors from the public and private sector, including Bill Gates, Rotary International and more to outline what is needed to stamp out polio forever: commitments, innovation, leadership and accountability. Secretary-General Ban Ki-moon called it a “decisive moment is a matter of health and justice” and announced he was making eradicating polio a top priority for his second term. At meeting with world leaders, Secretary-General Ban Ki-moon highlighted achievements in a push for maternal and child nutrition while renewing call to achieve zero hunger. The global Scaling Up Nutrition (SUN) Movement aims to improve the nutrition of all—especially women and children. With the recent additions of Burundi and Kenya, SUN now includes 30 countries that are dedicating their efforts to strengthening nutrition. These countries are home to 56 million children suffering from stunted growth due to chronic malnutrition, representing more than one-quarter of the world’s stunted children. When women are empowered – economically and socially – they become important agents of change. “Empowerment of women in rural areas is pre-requisite for global food security,” said UN Women, FAO, IFAD and WFP at an event to launch a five-year initiative to focus on improving food and nutrition security, increasing rural women’s incomes, enhancing leadership and participation in rural institutions, and creating a more responsive policy environment at national and international levels.